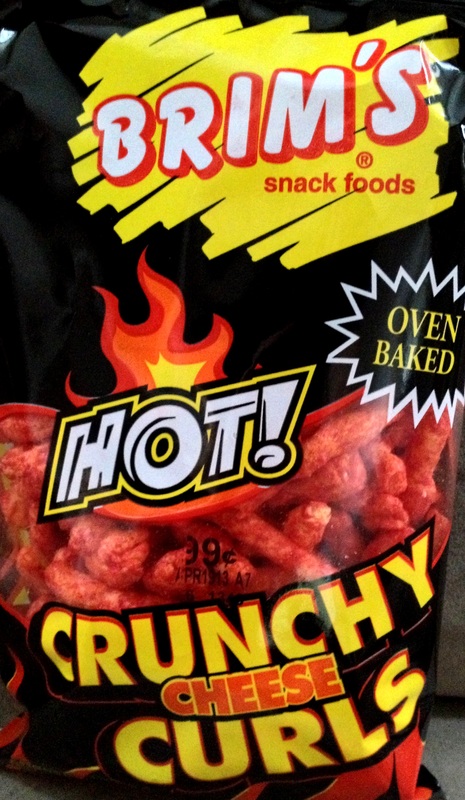 Cheetos Flamin’ Hot paved the spicy cheese puff road many years ago, and since that time, countless other hot & spicy cheese puffs have tested the market place. Probably our favorite variety of all time were Old Dutch’s Scorching Hot Cheese Flavored Crunchy Curls, sadly their run did not last very long, and they have been discontinued for many years. On the surface Brim’s Hot! Crunchy Cheese Curls appeared to have all of the facets required to exemplify a tasty predecessor to Cheetos classic curls – standard curl shape and size, bright-bright-bright spicy red, finger coating seasoning, and the mentioning of hot or spicy or flamin’ or scorchin or etc., as well as, cheese in the flavor name. However, execution of said facets fell far, far short of hoped expectations. Brim’s Hot! Crunchy Cheese Curls were not very spicy, absolutely not cheesy, and basically not very flavorful at all. In fact, the only flavor we did taste from these curls were the corn meal they were created from. In fact, these curls couldn’t even execute staining our fingers red the way any of the tasty cheese curls always do; which would actually be a great thing if they tasted better, and we actually wanted to be able to get away with sneaking them in the middle of the night. As always we would love to hear what you think. Agree or disagree. Let us know. I got these at dollar tree the other day. Like brim’s snacks, there are some good values to be had but, i won’t be getting these again. Like the rating, i also found them tolerable… Just barely. They always taste stale. I realized after having a handful, that i had tried them a few years back and forgot how gross they can be. @ Dirt – thanks for the comment. They do always taste stale.